Zucchini Linguini. | Eat More Plants. I love using my julienne peeler to make zucchini or cucumber pasta. Depending on whether I’m in the mood for a hot or cold dish (wanted a hot one today) I choose between the two veggies and go from there. I bought a few pints of red and yellow cherry tomatoes and figured what better way to pair zucchini and tomatoes than balsamic?! You can’t go wrong with that combination. Especially with some roasted garlic and red pepper flakes…mmm. If you don’t have a spiralizer or julienne peeler for making veggie pasta, I suggest searching online (amazon.com) for one. Zyliss is the brand of my julienne peeler and I think it cost me about 7 or 8 dollars. Worth its weight in gold, quite honestly. Such a great tool, I use it all the time! I still haven’t made a fruit noodle salad but I’ve seen it done and it looks pretty fab. Heat oil in a non-stick pan over medium-low heat. Add in tomatoes and garlic. Add oregano, salt and red pepper. Sauté for another 7-8 minutes until tomatoes are soft. Using a slotted spoon, remove the tomatoes and as much of the garlic as you can. Place them in your serving bowl. Leave the remaining sauce in the pan and reduce heat to low. 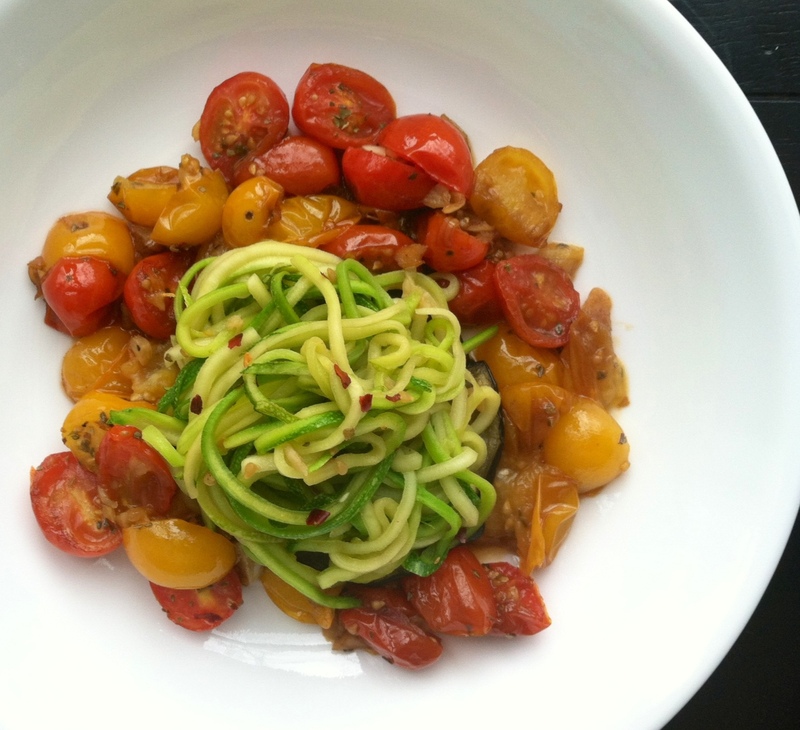 Julienne or spiralize your zucchini, you should have about 1 cup. Add zucchini to the pan, turn heat to medium and quickly stir fry for 1-2 minutes. You just want the noodles to soak up the sauce and get warmed through. They will get mushy if you overcook them! Place your noodles on top of your tomatoes and serve immediately. Some fresh basil would work wonders here but I couldn’t find any organic today. Reblogged this on lilGrizz & the World..